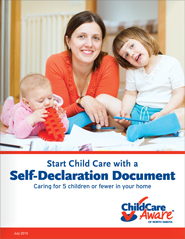 A Self-Declaration Document authorizes a child care provider to care for up to 5 children, under the age of 12. Not more than three children may be under the age of 24 months. A provider's own children, who are 12 years or younger, must be included in the total. - Does my community have additional ordinances that regulate child care? - Where do I go to get fingerprinted? Is there a charge? - Do other people living in my home need to get fingerprinted as well? - Do I need a fire inspection? - What training do I need to complete? - Where can I get CPR and first-aid training? - Are there any requirements if I have pets? Other household members, child care helpers or volunteers may need background checks. Contact your county child care licenser to verify requirements. Contact your county social service office before you take the course. Providing adequate supply of safe materials and toys for indoor/outdoor play. One working detector in each sleeping area and one on each level. Contact your county social service office to schedule a pre-approval visit after you have completed all items in steps one through four. Your will need to have the following documents completed and available for the pre-approval visit. Schedule an inspection after you have completed all items in steps one through three.